During December, especially during the weekend, you will see a lot of cars driving around with Christmas trees either on their roof or in trailers (or even in the car!). This to me is one of the ways that the arrival of Christmas in Denmark is marked, especially since in Malta we typically made do with plastic Christmas trees (and garish lighting…according to Michael!). Since moving to Denmark I have made sure that we have a Christmas tree every year, even in the years we were not to spend Christmas in our own house. 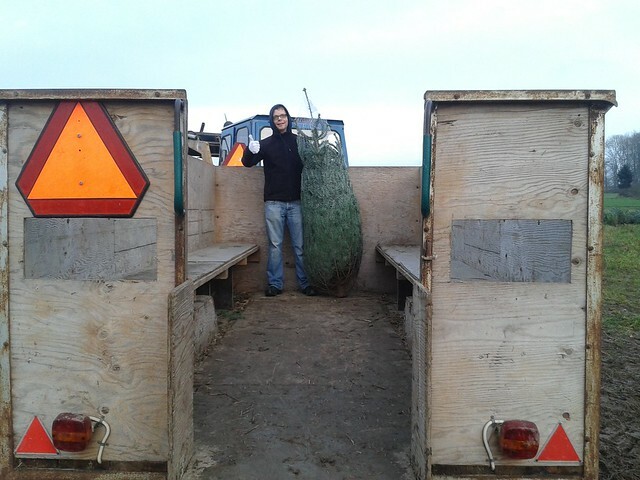 Previously we bought a ready-cut tree. However, since we now have our very own house we decided to ‘upgrade’ to a tree we chose and chopped down ourselves. 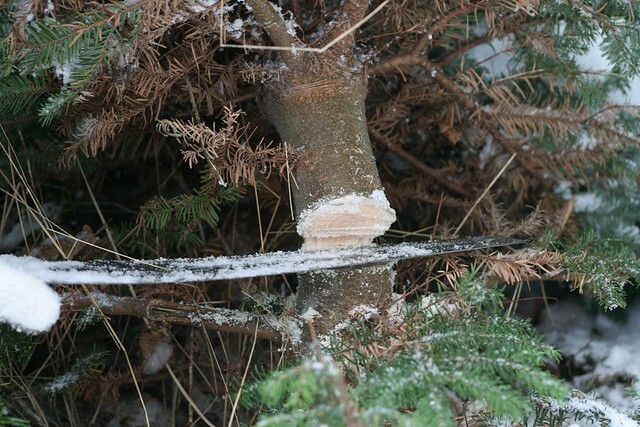 Chopping down your own Christmas tree is called ‘Fæld selv’ in Danish. Driving around the countryside you will often find signs during late November/December pointing the way to places where you can do this. If you receive ‘Sonderborg Ugeavis‘ you can also find a page of adverts on one of the pages (on pg. 9 this week, but for some reason this page is missing on the online version). Otherwise, in general, most places are located on Kær, near Augustenborg, near Nordborg, in Syd Als and Vester Sottrup. 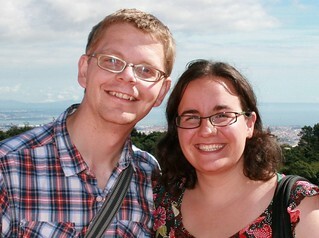 We opted to go and look for our tree on Kær, since this was the closest to us. We borrowed a trailer from our lovely neighbour (an upgrade from putting the tree inside the car as we have previously done, and contending with tree needles all year round) and off we drove till we found a place close to the airport. We parked our car and walked to the Christmas tree field. Once you arrive at the field you then have free reign to walk over the place till you identify the perfect tree for you. Everyone will have their own preferences…wide at the bottom, full on top, 2m high, 1 m wide or whatnot. We saw a perfect tree as soon as we walked in, but thought we’d look a bit further. Nevertheless, we returned to the first tree we saw! Once you identify the perfect tree you can then pick up a saw and go at the tree trunk till the tree is free. 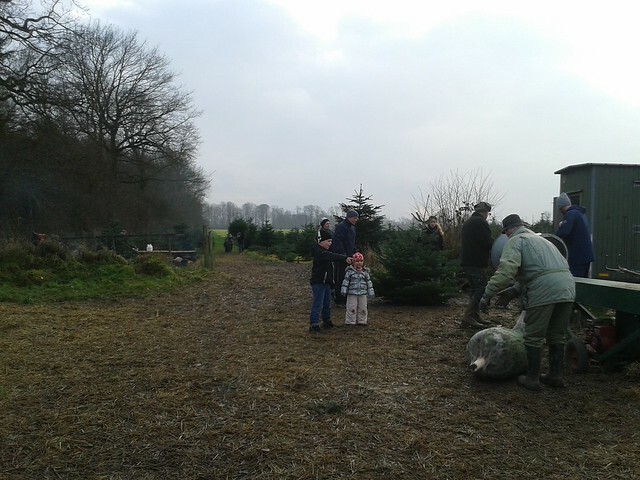 You then drag it over to the field entrance, where the owner is there ready to take your money (200 DKK in this case) and also put your tree in a net to make it easier to carry. At the place we visited we also could get some cake and a tractor was there ready to carry you back to the car. The result? A Christmas tree in our front room, all ready to be decorated, receive presents, and to be danced around in the coming days! 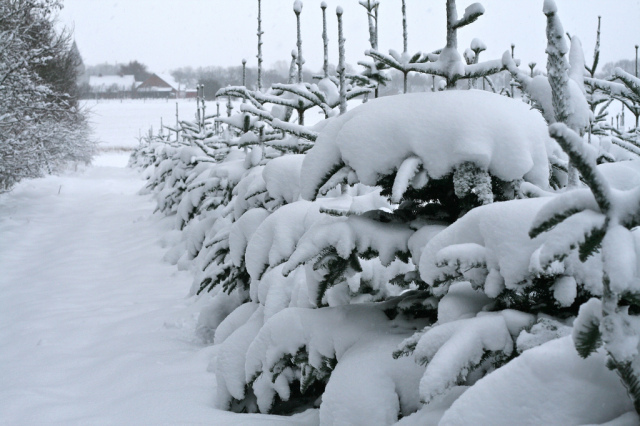 This entry was posted in Living in Denmark and tagged christmas, christmas tree, cold, outdoors by Ann. Bookmark the permalink.